Dealing with dryness, irritation, or a dull ache? The cause is staring you right in the face (from 9 to 5, at least). And according to The Vision Council, at least 69% of Americans suffer from digital eyestrain. Here's how to kick the pain — and keep on using your computer. 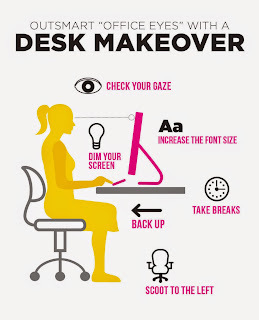 Adjust your chair so your eye level hits near the top of your monitor. 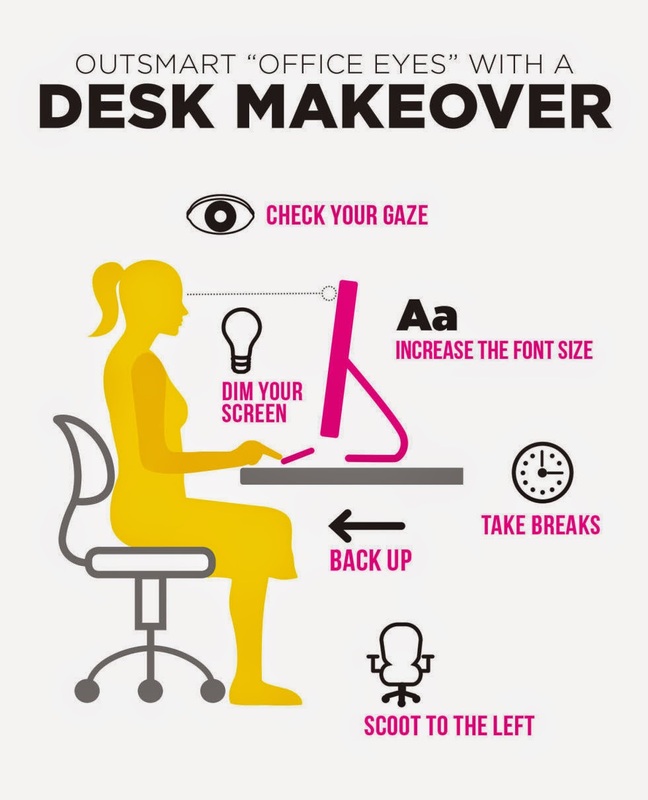 Since most people intuitively gaze downward 10 to 15 degrees, this position enables you to look comfortably at the center of your screen, says optometrist James Sheedy, Ph.d., head of the Vision Performance Institute at Pacific University. When your computer outshines the overhead lighting, the resulting glare can feel like an assault on your eyes, says Sheedy. Lower your screen's brightness level until it matches up with the room. 3. Increase the font size. When faced with small type, people often lean in toward their screens to read it, a habit that may make their eyes cross slightly (ouch!). A better idea: Make the font bigger — 12-point type feels good to many. 5. Then, scoot to the left. Most word processing software defaults to left-aligned pages that force you to shift your focus — you guessed it! — to the left, says Alan Hedge, Ph.d., director of the Human Factors and Ergonomics Lab at Cornell university. If you sit left of center, you can gaze forward instead. Much better! 6. Don't forget the breaks! Stick to the 20/20/20 rule: Every 20 minutes, look at an object at least 20 feet away for 20 seconds or more, says Hedge. (For bonus points, take a walk; changing your point of view lets you rest your "screen" muscles and engage others instead.) Blink rapidly, too: It refreshes your tear film. This story originally appeared in the May 2015 issue of Good Housekeeping.